Trump Taps Former Pharma Exec To Head HHS - Joe.My.God. 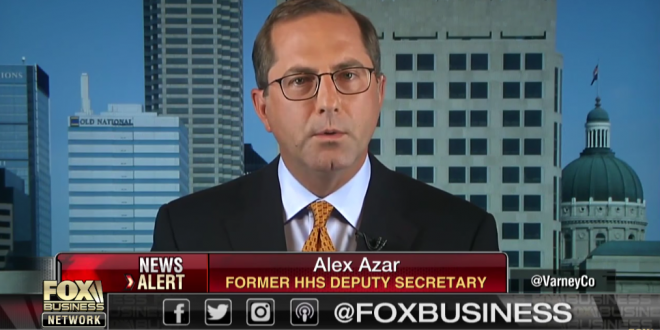 President Trump said Monday he would name former pharmaceutical company executive Alex Azar as secretary of Health and Human Services. If confirmed by the Senate, Azar would replace Tom Price, who resigned in September amid a scandal over his use of charter aircraft for personal and official travel. It’s the first time Trump has had to replace a cabinet pick after a resignation. Until January, Azar was the president of Lilly USA, the Indianapolis-based maker of household prescription drugs like Prozac, Cialis and Methodone. He was deputy secretary of Health and Human Services in the George W. Bush administration.